Chef & Registered Dietitian with a passion to creating foods with nutritional benefits! Favourite cooking shortcut: Freezing ginger for easy grating on a microplane! Recipe that you have always wanted to make but have yet to attempt: Chinese Steamed Sticky Rice Wrapped in Banana Leaves! These freeze-dried pears were hands-down totally delicious, candy-like and left you wanting more! The texture is kind of like Styrofoam in that the pear pieces are light, crisp, and easily dissolves on the tip of your tongue similar to that of cotton candy. It differs from traditional dehydrated fruit chips such as apple chips in that they are nice and crisp rather than “crunchy” and dry. The pears had an intense fruity flavour, which sometimes lacks in dehydrated fruit chips. I would highly recommend this snack for those looking for a healthier candy alternative, though would caution that 1 package probably wouldn’t be enough, so instead grab a fresh piece of fruit! Word of caution, don’t try “extending” the savouring of these freeze dried pears in your mouth, as they become very soggy and unpleasant! First off, I think the tuna salad kit is a fantastic addition to this ongoing trend of healthier "snacking." 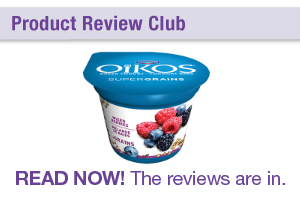 It provides a whooping 17g of protein which is far more than 1 granola bar, 1 small container of greek yogurt or even an individual container of cottage cheese! What's excites me is the ratio between the grams of carbs:protein, which is almost 1:1. This product definitely proved to be a satisfying snack for me. I ate it mid-afternoon and it kept me full until dinner time. I must add that I was a little disappointed by the flavour profile, as the tuna lacked a *zing. * The amount of black pepper was just right, but the tuna mixture could have benefited from some dehydrated parsley or chive flakes (added colour appeal) and definitely some lemon zest or extra lemon flavour, as the amount of acidity was OK but it lacked that lemony taste which I was anticipating for. As for the crackers, I would prefer one that was less buttery and more crispy such as those thin flatbread crackers. Now, let's just take a quick look at the added cost for convenience: $2.49 / tuna salad kit (85g tuna) $1.99 / flavoured tuna can (85g tuna) =$0.50 for 6 mini crackers + napkin and cute plastic spoon Bottom-line: The line-up of Clover Leaf Tuna Salad Kits proves to be a great addition to the snacking category for those who are on-the-go; need a quick and easy pick-me up; or perhaps for those times when you just forgot to pack a healthy snack but was clever enough to store some for emergencies as they are shelf-stable! (True story, I had a tuna salad kit in my cupboard which saved me during last summer's power outage!) For those who are foodie at heart, I would say, go for the "plain" canned tuna and flavour it up! I spotted this product on the shelf in the natural foods section of my local supermarket a few months ago and was intrigued by the vibrant orange hue. My first reaction after seeing the product's name "Red Palm Oil" immediately made me think of "hydrogenated palm kernel oil" an ingredient found vastly in processed packaged food. It wasn't until I researched further that I came to realize that the two oils (red palm oil vs. palm kernel oil) are distinctly different. Red Palm Oil originating from the fruit of the palm tree, is a good source of monounsaturated fats and also very high in saturated fat. However most of the saturated fat is in the form of medium chain triglycerides (MCTs) which get metabolized immediately by the body and emerging research is showing that MCTs may actually have a role in the prevention of atherosclerosis due to its anti-coagulation effects. 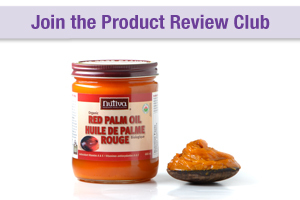 Furthermore, Red palm oil is touted for its high vitamin and antioxidant content namely vitamins A and E. However, I'm not convinced that one should purchase red palm oil as a means to obtain their daily dose of vitamins A & E, which can be easily consumed from a healthy balanced diet. Nutrition aside, I was very excited to put this product to the test in terms of smell, taste and culinary versatility. When I first opened up the jar and got a swift of the oil's aroma, it reminded me of the smell of freshly cut winter squash (ie. butternut/pumpkin/acorn). Then came the "naked" taste test, which in my opinion wasn't horrible. The oil melted nicely in my mouth and had an earthy flavour. I then proceeded to use this oil in 4 different applications. The first one being an easy-over egg, which turned out beautifully crispy on one side and had a crimson tint on the flip side. Next, I cranked up the heat to high, and using my wok made a delicious stir-fry, turning my sweet onions to slightly orange in colour :p but no taste deviations. Since the oil clearly imparts an orange colour to foods, I decided to use that to my advantage. I'm a huge fan of cooking and baking with red split lentils, but I really dislike that after heat is applied, the orange lentils turn to an unappetizing dull yellow colour. Therefore, I decided to cook my lentil crepes and lentil ginger soup using the red palm oil, hoping to have the final product reminiscent of the red split lentil's original orange colour! I must say, the red palm oil is definitely a keeper for these 2 recipes! Bottom-line: In my opinion, red palm oil can be a good addition to your repertoire of culinary oils, but I would definitely make sure you store it in a cool area, so it remains solid at room temperature. This prevents the oil from spilling all over your jar! When deciding on when to use this oil, I would choose it for high-heat cooking methods such as stir-frying and for dishes where you would like to enhance/extenuate the colour of the end product. For example, red palm oil would be fantastic in red curries, paella (ie. saffron colour), biryani (ie. tumeric colour - double whammy! ), and dishes using red split lentils. Lastly, I am looking forward to try making my savoury sundried tomato and herb scones using red palm oil (in it's solid state) in place of butter! I often use coconut oil in my sweet scones and they turn out amazingly flaky just as it would if I used butter.